UPDATE (Feb 9, 2017): For up to date information about our Memberships please check our Pricing & sign-up page out. Last year many themes were added to our club, especially for creation of classic business presentations, landing pages, e-commerce and non-profit websites. We’ve grouped them all, added the relevant plugins and graphics in order to build Premium Themes package perfect for the conventional websites. PremiumX membership is the best unlimited package. Today half price only! Since 2009 we’ve created huge amount of templates for business use. Almost all of them are still supported and updated. Even those oldest ones. We continuously enhance the whole concept and bring innovative solutions. From countless possibilities for customizing of our templates directly in wp-admin, through page builder and various elements for user friendly usage and simple work, as well as the extraordinary design. Last but not least we are the only multilingual WordPress theme provider. Only with us you have the option to choose from a large number of translated and multilingual themes and plugins. One part of PremiumX membership is Ait Languages. It is a plugin with enclosed translations for wp-admin and front end along with the multilingual functionality. You can select your languages directly in the settings via wp-admin without a need for uploading PO files. contain Ait elements toolkit plugin. Who is PremiumX intended for? It’s for you if you want to have the best wordpress themes, plugins and functionalities ready at hand. With our templates you will create eye catching website with professional design. Multilingual websites and websites in other language than English including the administration interface. Today, you can pick whichever template you like and we will throw in all the other themes from our Premium line. Gain all the templates for the price of one. Today you can get this package for unbeatable price of $89. One of the recent changes is also this Basic Membership. It contains only Premium templates. It’s ideal for those who need just the basic WP functionality and template settings or would like to get familiar with Ait Themes Club. It’s designed primarily for customers who build information and advertising portals. If you need to work with special functionality like adding items to a catalogue, maintaining and editing items, payments, reviews and other related functions of listings websites. Access to Google maps icons and categories is included in this package. You will get all the directory templates, plugins and graphics all together under one package. Furthermore, with Directory Membership, you gain access to absolutely all Premium templates, Premium plugins and Premium graphics. Single directory products. So those products, which relate to the creation of listings portal. Directory templates, plugins and graphics can still be purchased as individual products, piece by piece. What’s the difference between PremiumX and Directory Membership? What happened to the old packages? What’s changing for you if you bought any other previously available product or membership in the past? You don’t need to worry, you can continue to use all the previously purchased products and memberships without any change. You can extend them for next period now or before the expiry date according to the original terms for the original, guaranteed price. Or you can decide for one of the new packages and gain more benefits. Any changes to the terms of purchase? Most of the terms and the conditions of purchase remain unchanged. Along with the purchase of individual products you gain also access to our support and updates for the period of 12 months since the date of purchase. We do not limit the number of domains you can use our products on. Beware of big change in the Money-back guarantee policy! Money-back guarantee policy was extended to all our products, including the memberships. You can now buy, try and ask for the refund even for PremiumX and Directory memberships. Caution, instead of 30 days, you have only 10 days for this. Our products are result of countless hours of hard work of all the members of our excellent AIT team. The value each one of us puts into our products is that unique ingredient which creates the core that you can get with us. Possibility to upgrade to a higher package? It is possible to upgrade the package by paying the price difference during 30 days from the date of purchase. Log into your account and go to My Admin tab. There you can find the list of all previously purchased products, option for upgrade or renewal. Bao giờ có khuyến mại discout 50% vậy ? I am already a customer and confirm the quality of products and excellent service. This is an offer not to be missed. thank you so much for your compliments. Anyhow, would you mind to share with us what would you make happy, which feature or function would you require? But when i want to buy it shows $299 ?! Tell me plse how i can purchase the Premium line for $89 ? thank you for your question and feedback. We apologize for any inconveniences due to this: in fact, it is a old price from the past /3 weeks ago/ when we have been offering PremiumX for the special price. The current price is 199,-USD of this package. Directory membership costs 299,-USD only. Thank you for understanding. Aj poslať e-mail, aby účtovali poplatky súvisiace nákup. Témach sa môžete vrátiť? thanks for your message. We are sorry for the delay, you’ll get a pro-forma invoice asap. Thanks for your patience. You’ll don’t miss a special offer. I sent you a pre-sale questions message earlier this morning but I´m not sure it reached you (can´t see it on the forum or in the presales popup box or even see a copy in my email account or anywhere else….) so I´m sending it to you once more now. Also, I forgot to state the questions are regarding your Directory plus theme. Waiting for your reply, Thanks! 2/ are homepage, single listing and blog post areas fully widgetised so that we can use ad banners, social media icons, call to action buttons etc. according to our needs freely? 5/ is it possible to get a carousel box displaying 4-5 products from our eshop directly on the homepage as well as on each single listing and blog post page? Especially questions 1, 4 and 3 are vitally important to us. 5) yes, it is possible. Should you have further questions, please contact us back. I have tried to purchase the full membership for directory package for $69 dollars but it does not go through. Can you please advise. The price now is $99 dollars. thanks for interesting in our products. 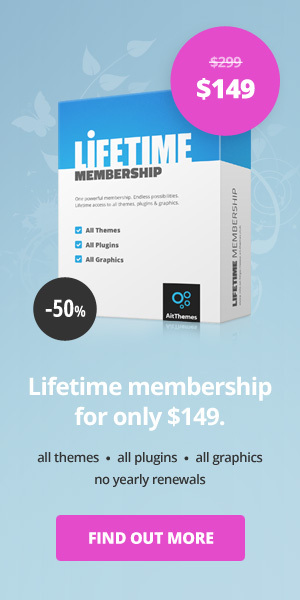 The current price for Full Membership package is $99,- excl. VAT if applicable. You have active account with Item Reviews plugin. From 2018-04-12. Upgrade to Full Membership by paying the difference between the prices was available till 2018-05-11. Thanks for understanding.